Discussion in 'exocad' started by mill3d, Mar 27, 2019. What parameters should I edit to get nice thin margins? For now the minimum thickness is till the margin and if it is 0.8mm it is very bulky. I usually reduce the minimum thickness at the end of designing and smooth the margin area thinner. Is there any other way? I attach parameters for zirconia. Maybe you should try which one gives you better results!! I think my parameters are creating even thinner margin, but I have to reduce the minimum thickness after design as I want to have enough strength elsewhere. I don't understand your problem... I for ZR set the minimum thickness at 0. 6mm, 0. 3 or less in CrCo, and the same for Emax veneers. We don't reedit parameters, we don't need it, I'm sorry but I don't know how to help you. ohhh f***!! I had not seen the attached image!! Yeah, for me, 0. 15 of horizontal space is too much!! That is the case yes, so called vertipreps. I will try with reduced horizontal parameter. Also how to reduce the margin on the screw retained crows.... there is this collar that can only be reduced when dragging it up, but that is not always possible. Same parameter? Are crowns on implants or interface? when the perp of the cavity is automatically generated by library, only affects the minimum thickness parameter!! You can reduce the minimum thickness, or modify the library to give it another emergency profile. 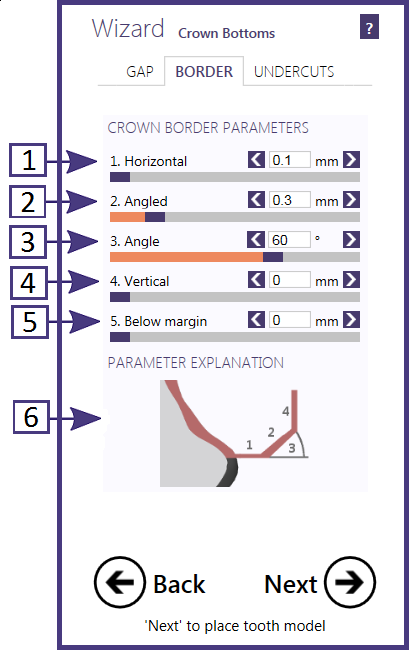 ok, then these in the previous case, and you get a prepline design window "Crown Border Parameters", so you can play with those parameters. if the minimum measurement is still very thick, open the workparameters and modify the "min.value". I show some pictures. With every implant case there is this yellow ring. When at starting position, it is large - with libraries sometimes more than twice as big as after pulling it up. As you see it goes thinner when pulling up. How can I edit this "yellow ring" parameter to be thinner to begin with. This strated with valletta, before that it was perfect... one of my computers still has the older verion and I can actually edit them alot thinner, but I dont want to use the older version just for that because 80% of the jobs are implant based. 1º mini screen of "Crow border parameters" = The "horizontal" parameter is taking out the edge of the perpline. 2ªemergency profile design = The "minimum thickness" parameter won't allow you to have such a narrow part and pull it out. think that where the margin generated by the perpline ends you should have more than the minimum thickness... you can play with the "angle" and "angled" parameters to finish having more than the minimum thickness. I am able to get thinner prep lines by reducing the horizontal border to 0.1 and before finishing the job by reducing minimum thickness from 0.6 to 0.4 and smooth near the prep line. The outcome is very good. With implant jobs based on libraries - for example straumann and ankylos, the margin ring is massive and need to be pulled up... can I edit this in implant editor? Can somebody give me a link for the editor?